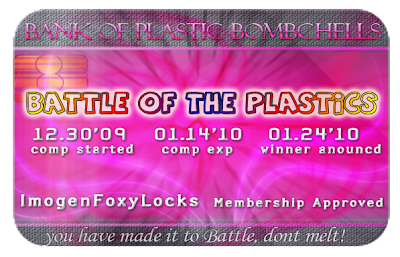 I was sooooooooo excited when i saw this competition by Bombchell, i rarely enter them but this one i had to! I love fake hair, eyelashes, tan the lot! (expect surgery!). I get called Barbie on a daily basis by people on Youtube so i had to use her as my inspiration. gorgeous! you really embraced the Barbie look. Sooo gorgeous! Love it, love it, love it! ♥ ♥ ♥ Barbietastic ♥ ♥ ♥ Love it!!! You are such a natural Barbie Doll. Very pretty and when I first saw your youtube that was the first thing that came to my mind when I saw you.....YOU LOOK LIKE BARBIE! BEAUTIFUL! Good Luck. I am new to your blog and youtube channel. Have you done a tutorial on your eyebrowns and also how you trim you bangs into the style they are in. I would appreciate it if you have done it and share the link, if not could you please do? Thanks so much!! You're gorgeous!! I voted for you! :D Hope you win! Happy New Year 2010 everyone! !